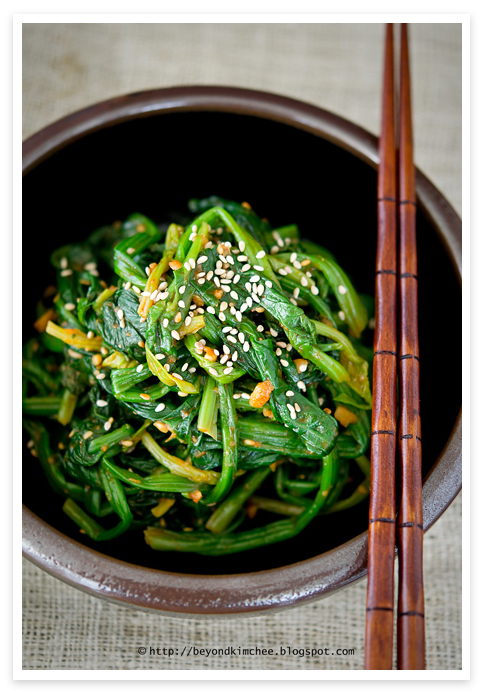 Korean spinach (shigumchi namool) is one of the most popular side dish (banchan) in Korean restaurants. 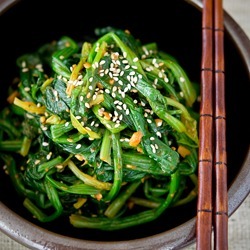 I have posted my version of Korean spinach before and today I would like to add one more. 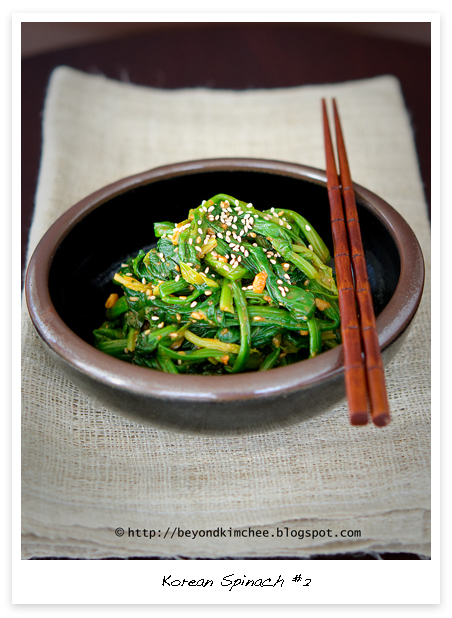 This one is more of southern style rustic version and brings different flavor to the ordinary Korean spinach. This is how my mother use to make and it is delicious. Don’t worry, I won’t put shrimp powder this time. This is a total vegan dish and as healthy as it can be. I sometimes empty out a bowl of rice with just this spinach alone without anything else for my lunch. It is a satisfying and feel good food. 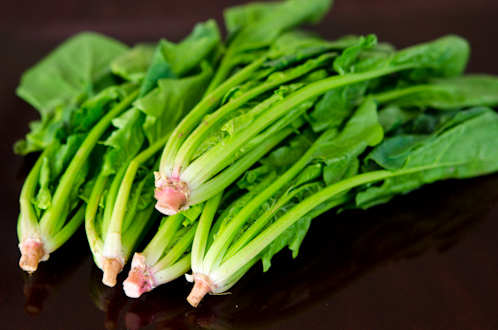 For this recipe, look for spinach that are shorter in length and has a pinkish color on the root. They are tenderer and sweeter, close to the Korean origin. Feed to hamsters if you have. They love it. FYI, I do NOT like hamsters. 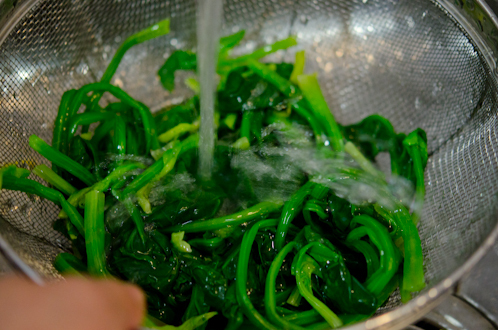 Unless your spinach is grown organic, you want to clean them well.., really really well. Use baking soda. Soak with 1 tbsp of soda for 5 minutes and rinse well. Blanch in the boiling water for 1 minute. 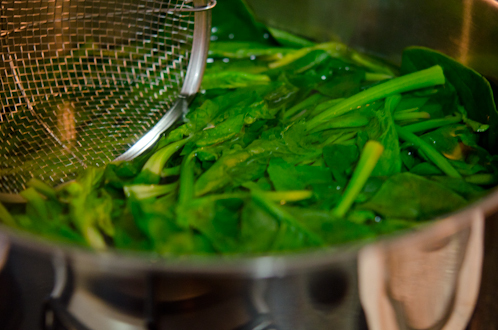 Untangle your spinach in a mixing bowl. If your spinach is too long, cut into desirable size so that you don’t get choked. Here is the flavor crew. 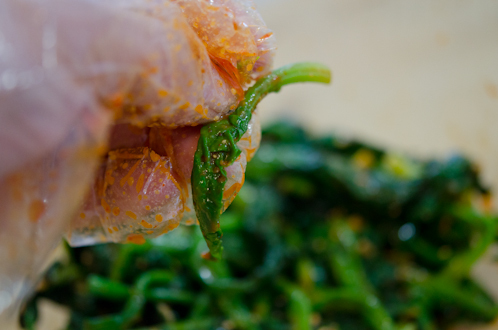 Using your finger tips, smear those two pastes together to bind. If you have long fingernails or just got your nails done in the nail shop, you better get one of those disposable glove. Time for the Korean tossing magic. 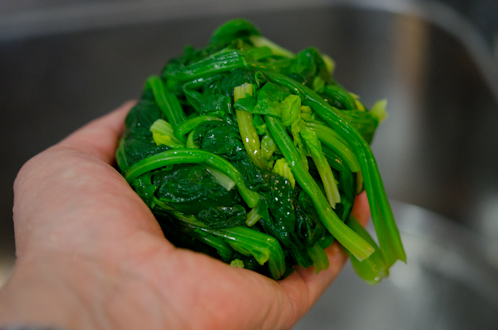 Toss your spinach as you gently massage them together so the seasoning can incorporate with spinach, every single strand. Finished! Quite easy, wasn’t it? All you need is a bowl of rice to enjoy this flavorful side dish. Yum! 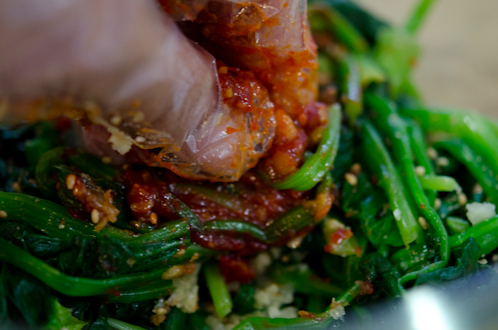 Add the rest of the ingredients into the bowl, using your finger tips smear the doenjang and gochujang pastes together to combine and then toss everything together as you gently massage around the spinach, so that every strand of spinach will get seasoned. what a great tip for cleaning the spinach! i'm excited to try it out soon. i saw some of this smaller variety of spinach at the farmers market last weekend--i will definitely have to go and get a few bunches! :) thanks for sharing this recipe, yum! "Unless your spinach is grown organic, you want to clean them well" Sorry, but no: organic does mean it's going to be free from contaminants. E.Coli and salmonella do not distinguish between organic and conventional crops. i love everything korean! and i love your blog. great tip on cleaning the veggies with baking soda. thanks. I've always enjoyed banchan when I visit a Korean restaurant. Sometimes I even like the banchan more than the main course I get. 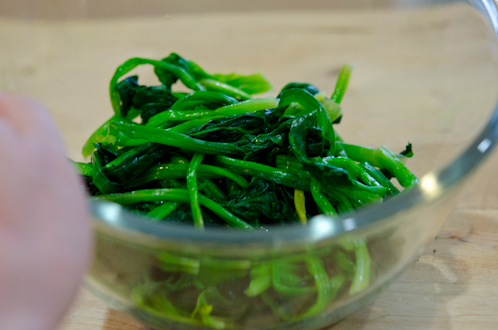 Your spinach side dish looks absolutely delicious! 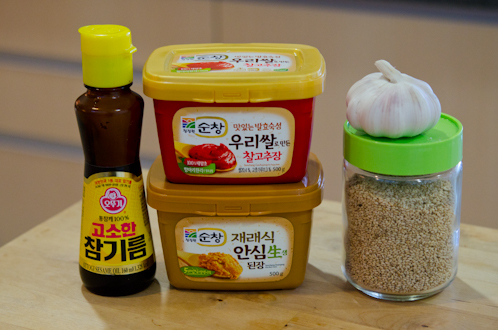 What's the difference between and doenjang and gochujang? I always get a big box of gochujang and use it for all the Korean dishes that call for the bean paste. Thanks for sharing! 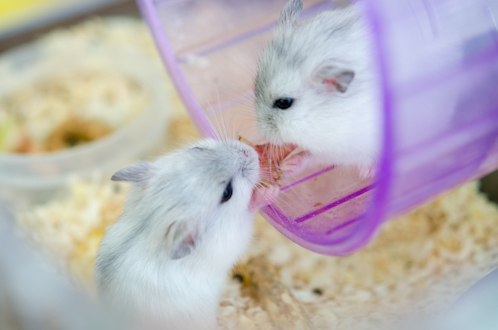 Awww...the hamsters are so cute! My son had mice so I had to get used to them. I've only known about the vinegar-in-water tip for cleaning vegetables so this tip is good to know as well. Will need to definitely restock on both of those korean pastes...I go through them fairly quick but never have time to go into Milan to buy more. 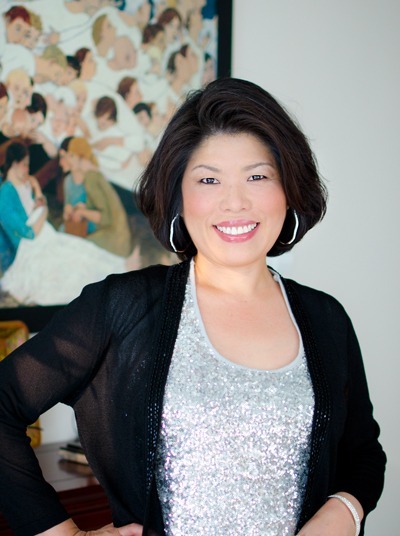 Oh, and congrats on being chosen for Blogs of Note! Ha ha! I, too, sometimes like the banchan more than the main dish. 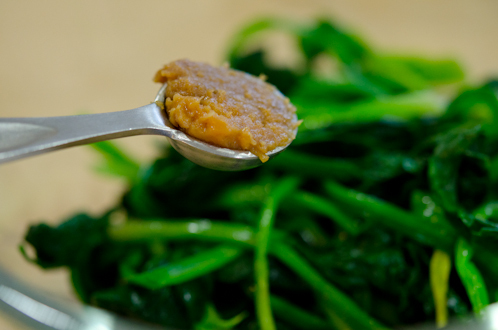 Doenjang is made of fermented soy bean and it is quite pungent. 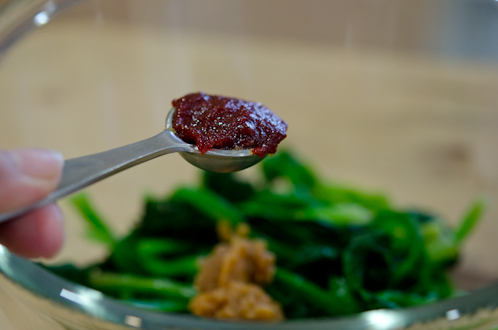 Gochujang is Korean red chili powder mixed in rice flour. Can't alternate each other in the recipe since they are completely different. Thank you Rowena. Mice sounds worse than hamsters. I am not a big fan of rodents. Hope you can give this spinach a try. 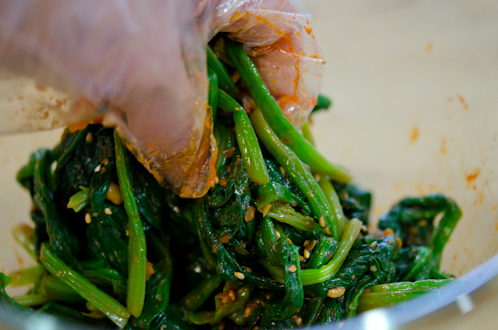 It is different than ordinary Korean spinach and it tastes good with rice. wow.. thanks for sharing this ingredients, i taste it before back in japan. Yes, It only takes a few minutes to whip this up. Hole you like it, Lucy. 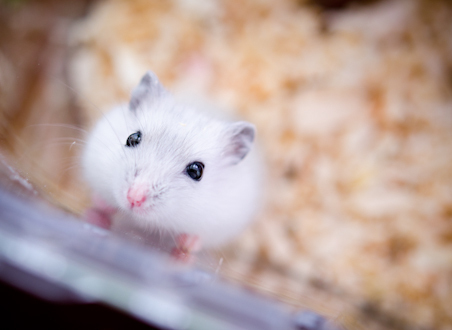 That's really cute of you to include cute hamster in your blog. Speaking of korean spinach, I went to a korean restaurant, couple weeks ago for dinner. I ordered Galbi and sticky rice. Anyways...what I really love of this restaurant is that we got a bunch of appetizers and one of them is the kind of spinach similar to yours. I may start learning how to make korean food. Super appetizing! This looks delicious! I love spinach! Thanks Erica. Vegetables from farmers markets are the best. The short spinach is far better than the longer one. Hope they still have some. Thank you. 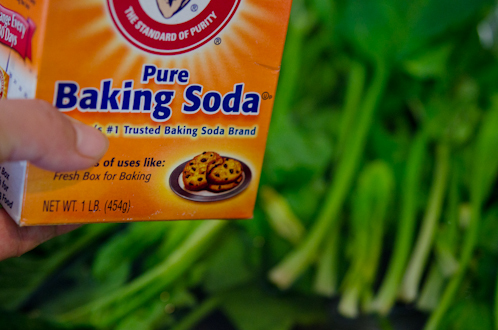 Cleaning vegetables and fruits with baking soda is great way to get rid of pesticides on the surface. Thank you Gria. 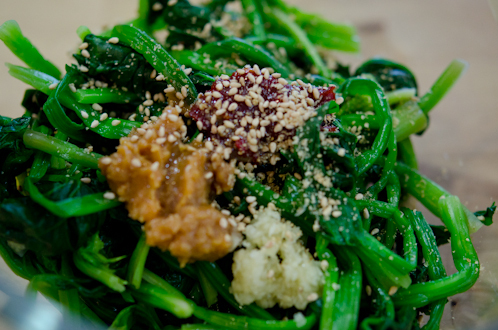 Korean side dishes are really appetizing and most of them are quite healthy. 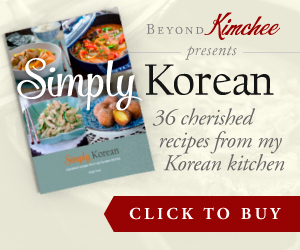 Hope you can start making Korean food at home. I like doenjang in my namul dishes as well. Your spinach looks so fresh, and the dish looks delicious! I love your step by step pics and again another yummy recipe! can we request food?I started a blog in december the link is http://www.letswatcheverything.com. It is pretty much based on entertainment. I have all the latest movies that are out in theatres, tv shows, awards, video games, music and software. I have noticed that my traffic as incereased a little bit but not as much as i want it too. I been reading around and people have been saying the best way to get more traffic is to post on other blogs which will help any person out. Your article is very good. Thank you for taking the time to share with us. what if I have a cat ? Can my cat have your mice ? I cannot wait to try it, you make cooking look so simple. ooh I love this! I think I actually prefer this rustic version, it sound spacked with flavour and hearty goodness! That is one perfect looking garlic bulb! Thanks Holly, do you think i can use this recipe for cucumber instead? Haven't seen this type of spinach! mmmm I love spinach! This looks like a great recipe! Will be making it soon! Hi, I would like to know, I saw that Korean always hv plenty of side dishes in every meal time. Some are prepared before and kept in refrigerator. Could u please tell me what are those side dishes that can be kept for long time in refrigerator? Does spinach one of them? What I knew that spinach hv to be eaten when it's fresh. Thanks in advance. Spinach can last in the fridge for a week. 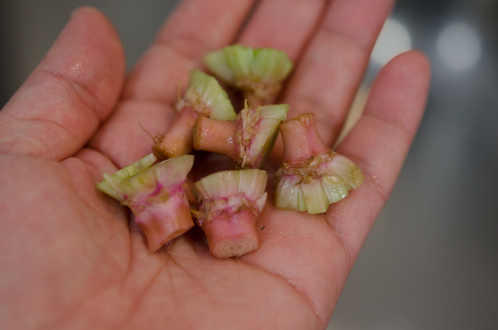 Any Korean side dish made with fresh vegetables can last about a week in the fridge. Some made with dried or preserved can last whole lot longer. Hi,, nice to find ur recipe!! I'm Indonesian and I can not find the chili paste here. Any idea? This delicious-looking recipe just showed up on Yummly, so I'm going to bookmark it. How similar is doenjang to miso? I have miso and gochujang in my refrigerator at the moment. You can substitute with miso in place of doenjang. It should work fine.